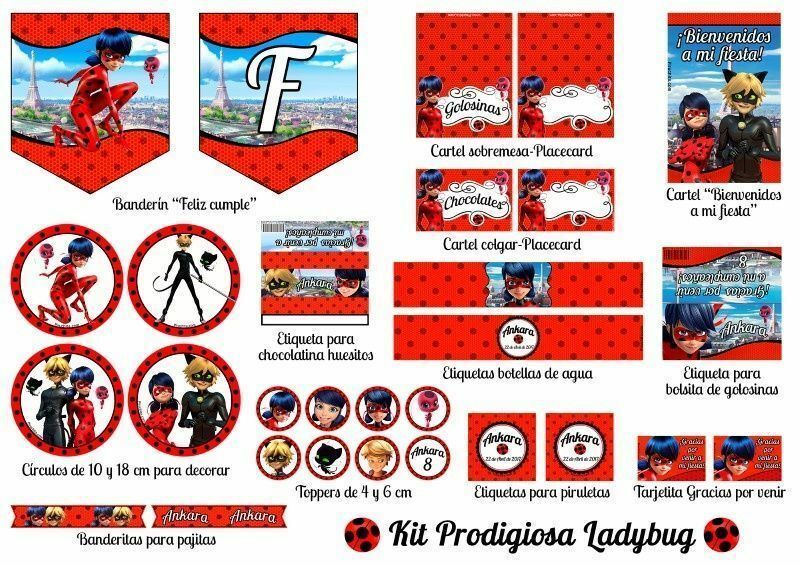 Hand we share a Ladybug basic kit for birthday parties including Birthday invitation Prodigiosa: Las aventuras de Ladybug for free, and bonus 10 × 15 picture to put in a box on the candybar and the thank you card for attending the party. ALL FREE! Ladybug is a superheroine to the classic style of supergirl in adolescent mode, since she has a double life, normally she is a teenager in love called Marinette Dupain-Cheng, until the moment in which her intervention is necessary and with the help of Kwami Tikki she transforms into Ladybug with a disguise pretending to be a ladybug with fantastic skills. To start you can simply create any kind of thing magically and you can free people who have been possessed by akumas. In addition to having a lot of agility and speed, it has a somewhat peculiar weapon, a magical yo-yo that, besides using it as a third hand and very useful in combat, also has different functions of communication, tracking, information, etc. In his adventures he usually coincides constantly with a somewhat arrogant superhero with whom they help each other continuously, Cat Noir. 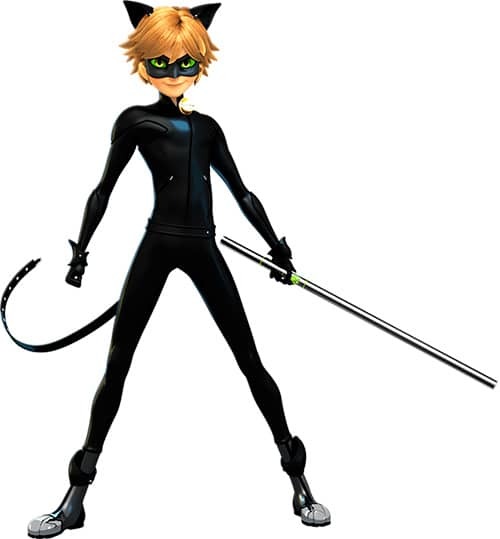 This superhero with a cat costume also has an impressive agility and speed, in addition to fight hand-to-hand with the help of his metal baton, which has many other uses similar to those of Ladybug's Kwami Tikki. His most powerful ability is "cataclysm" that simply destroys everything he touches with his right hand. 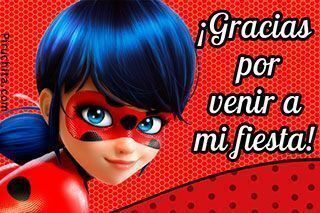 To give the plot a romantic touch, it turns out that Marinette Dupain-Cheng (lady bug in her normal adolescent state) is in love with Adrian, who does not pay much attention to him, since Adrián is actually the superhero Cat Noir, which go after Ladybug. Ladybug tries to dodge all Cat Noir's attempts since she does not know that Adrian is actually in normal life ... come on, they both like each other, but as they do not know their real identities there is no way to make them finally come together. Tikky and Plagg, which are the "Kwami", a small creatures that fusing with the Marinette earrings in the case of Tikky makes it transform into Ladybug and confers all the powers, and Plagg merges with the Adrián ring turning it into Cat Noir. Lepidoptera / Hawk Moth: the bad bad of the series, the essential, without him, there would be no series;). He also has his own Kwami, with whom he converts Parisians into villains with corrupt akumas and butterflies, which only Ladybug can release with his power. Alya Césaire, Chloe Bourgeois and Sabrina Raincomprix They are friends and classmates of our superheroes. Ladybug poster for candybar Welcome to my birthday party. Included in the bonus. That is why the Prodigious Birthday Invitation: The adventures of Ladybug will cause a furor among all birthday guests. And do not forget also the bonus that we included in the same free download and that we have commented at the beginning of this publication. Although in Spain this series of cartoons is known as "Prodigious, The Adventures of Ladybug"The original title is"Miraculous: Les anventures de Ladybug et Chat Noir", Which suggests that it's a French series, but it does not stop there, it's actually a French-Japanese-Korean collaboration, and that the influence of Asian countries is more than remarkable in some facial features as well the eyes of characters like Marinette Dupain-Cheng (Ladybug), Adrien Agreste (Cat Noir), etc, the presence of "Akumas" (demons in Japanese) and in the type of animation, which has been evolving in the chapters. Thank you card Ladybug for attending the birthday party. Included in bonus. 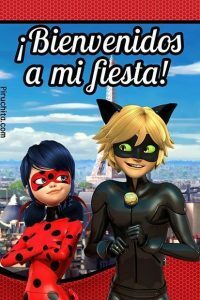 Even though there is only one season completed and already broadcast in many countries, with its 27 episodes of 22 minutes, Ladybug It has conquered the heart not only of girls, but also of teenagers and many adults who have been hooked to the series while accompanying their children. And it is a series of animation that initially was to be aimed at an adolescent audience, but ended up being more popular in a younger audience, so unintentionally had a fairly large audience in terms of age range. 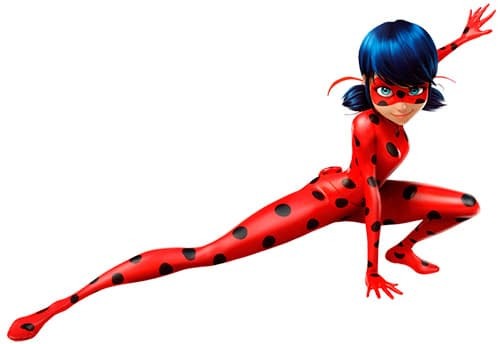 The success of Ladybug made it possible to quickly start to develop 2 more seasons, and the past 9 of September of 2016 its author and director Thomas Astruc confirmed that the script was already finished with other 26 episodes including some special chapters of almost twice as long for events as Christmas and Halloween. The official date of issue is not yet known, but it is expected to be this same 2017. As a curiosity, comment that the 3 season has also been already written, in order to avoid that there is a great stop of the broadcast between both.